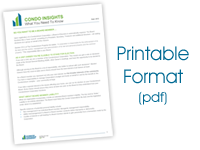 Confidentiality is sometimes essential for the Board of a condominium corporation. While a social club atmosphere is healthy when times are good, difficult issues involving specific owners will arise that require tough decisions to be made. These are best discussed behind closed doors, and details should not appear in meeting minutes that might later be circulated to owners. This can be an interesting balancing act. Some condominium communities hold open Board meetings, so that other owners are informed and feel involved. Yet if the Board is discussing possible foreclosure on suites whose owners are not paying their contributions to common expenses, the guests should be asked to leave, and minutes might best omit the suite numbers and names of those affected. There are other issues that require confidentiality. Any instance that could embarrass an owner deserves privacy. In the first place, an alleged transgression could be a simple mistake, and it’s not fair to publicly discuss the noise thought to be coming from one suite, for example, when it later turns out it was coming from next door. In short, any potential discipline issue or concern affecting a homeowner’s personal situation or finances should be discussed privately. As well, Directors should be reminded not to disclose those names to owners who are not members of the Board. Minutes can and should still be recorded fully. In this example, Board members, other owners, and even potential home purchasers reading the condominium documents, all have a right to know how many suites are in arrears, what the impact is on the operating budget, and what steps are being taken to collect the needed money. Condominium owners reading the minutes will be reassured to know that their Board is protecting the collective interest. But specifically which suites are involved is not essential knowledge for owners who are serving as Board members. Underlying this advice is the fact that while condominium corporations are legal entities, they are also political organizations. Human relations are important, as is fair dealing with individuals, consideration for their circumstances and, of course, confidentiality on sensitive issues. As we see over at City Hall some days, this expertise can even be beyond the grasp of large-city politicians and administrators, so we shouldn’t set the bar too high for modest condo communities with volunteer Boards of Directors. Yet “best efforts” count for a lot. Whether you are self-managing 16 homes in a four storey walk-up or govern a 160-home townhouse development with professional management, be sensitive to how it would feel if you were the party being discussed. Behind closed doors your Directors can have a full discussion, all the options for actions can be explored, minutes can record what was decided, but no one will face embarrassment among their neighbors beyond the Board. Accredited Condominium Management is a Calgary property management company. Since 1994, we have been specializing exclusively in residential and commercial condominium management and homeowners associations.